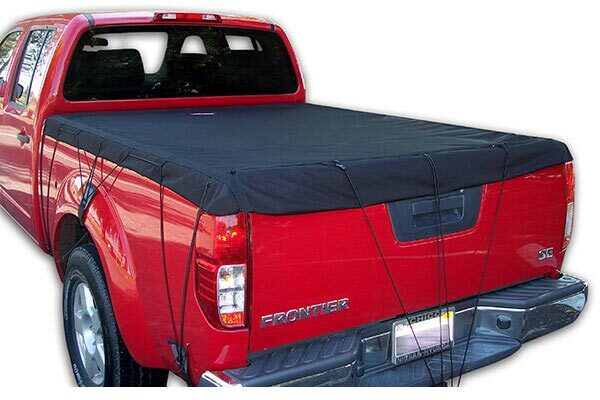 Discover how a truck tarp protects your cargo and your truck bed. A blue plastic tarp stowed in your bed isn’t a real truck bed tarp. It’s just a quick fix that leaves your cargo exposed. A quality truck tarp is an inexpensive, but effective way to safeguard your truck bed’s contents. If you don’t want to go with anything permanent, the Gladiator Mesh Tarp is an excellent product. Manufactured from a heavy-duty rip-stop mesh fabric (rated at an impressive 278 lbs per inch) and surrounded by 1.5” webbing (rated at 2,250 lbs per inch), this tarp features grommet anchoring points to which you may add straps to increase the capacity. It won’t stretch or stress under a load, but evenly distributes this load over a wide area. Available in different sizes to fit just about any truck bed dimension, it comes with handy hardware straps that extend from extend from 3-9 ft.
And since we’re on the topic of protecting your payload, a good cargo net is an excellent investment. Truck beds, especially when they have a bed liner, can be very slippery, and cargo nets solve that problem. Taking bed-protection up a notch brings us to the subject of tonneau covers. These are a little more expensive than a truck tarp, but they’re more permanent. They come in a variety of styles and a hard-shell tonneau cover will even help you out a bit with fuel efficiency. 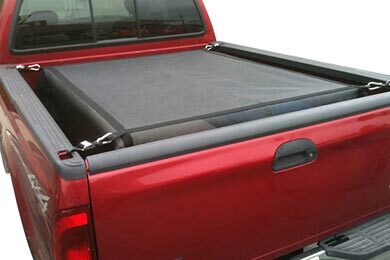 Soft tonneau covers are less expensive and also come in different styles. For example, the Extang Trifecta 2.0 Soft Folding Tonneau Cover combines a durable tarp with a frame system to create a product that folds. If you work your way BAK’s selection of tonneaus, you’ll find hard covers that roll up or use segmented flip-up systems. Check these out if you’re in the habit of carrying your gear in your pickup bed. Reference # 756-912-698 © 2000-2019 AutoAnything, Inc.